Here at P&W Photography, we specialize in documentary storytelling photography. Unlike traditional portrait photography, our goal is to capture real life. Life doesn't happen in a studio, it happens in your home and in the world around you. Focusing on real moments & interactions instead of those that are posed & directed helps to create images that are meaningful & packed with an emotional punch. 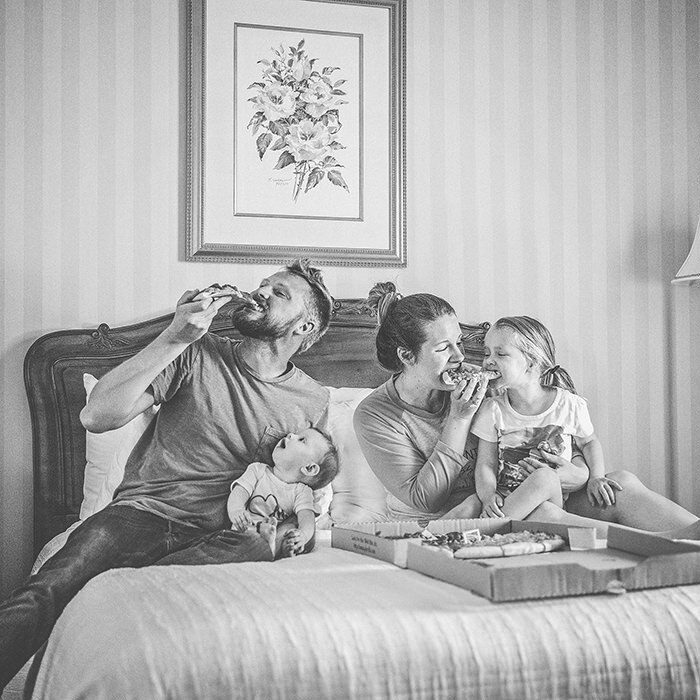 P&W Photography are Phil & Whitney Mayhew, a husband/wife team located in Nebraska & documenting the good life throughout the Midwest. P&W Photography are non-traditional, storytelling photographers who specialize in lifestyle & documentary-inspired photography, making it their goal to capture authentic moments & genuine emotions. They are always eager to travel to new places & meet new people. Phil enjoys tacos & cheeseburgers. Probably too much. Also pizza. He loves listening to vinyl records & walking the cobblestone streets of Charleston. Above all, he is grateful for undeserved Love. Whitney is fueled by fashion & essential oils. She's a Southern Belle with the sweetest accent this side of the Mississippi. She loves vintage jewelry & cannot bear the thought of passing a farmers market without stopping. ​Phil & Whitney are parents to two incredible little girls & a sweet Morkie pup. They recently fulfilled their dream of restoring an old, historic building & their love of antiques will likely lead to their television debut on A&E's Hoarders. "I cannot say enough wonderful things about Phil and Whitney! I work in the wedding industry and run into many photographers [and] these two have earned many gold stars in my book! So sweet and so easy to work with - not to mention how incredible each and every photo is! I will forever recommend these two to my clients!" "Phil and Whitney [are] positive, kind, hardworking and extremely talented. They [got] us so many memories with their unique documentary style. They do not settle for getting you the 'run of the mill' family photos. The work is custom to the people and we feel like we got genuine moments that represent our family." " [P&W Photography are] amazing. Every picture had us oooing and ahhhhing. [They] captured our girls, their sparkle, and shine. We are so over the moon with [their] work. [Phil & Whitney] have a gift, an eye, and perfect shutter speed. I'm swooning." "Phil and Whitney bring more than their cameras, they bring enrichment. [...] They are friendly, professional, smart, creative, kind, and extremely talented. They are also very intuitive - like getting detailed shots of special things and special moments that are important to you and your family but you never even mentioned." Anyone with a good camera can claim to be a photographer. Phil and Whitney go beyond this--they are artists. Their creativity and skill shine through in every image you receive. Book a photo shoot. You won't regret it!
" [P&W Photography are] the most incredible photography team! We truly appreciate the moments they are able to capture for us!!"